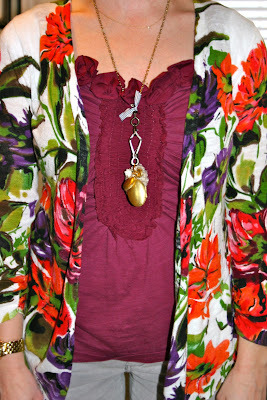 Tricia's Take: OOTD- Flowers and trinkets! Anthropologie I think you are trying to mess with my resolutions because I found another must have item!!! You look so cute! I love your closet outfit. :) I, too, am getting stressed by all of the cute dresses that Anthro is putting in front of me. Have fun teaching your parenting class.. I am SURE the kids are still ok if they play outside a lot... it is good for them. this outfit is so pretty! I love how bright it is, especially considering how grey and nasty it must be out! Great job shopping your closet! Although, those shoes are so cute and shiny and oh-so-pretty with their ribbons that they are wearing on my resolution to shop MY closet, haha! I love that cardi...I have it too :) That reminds me I'll have to pull it out soon...well, maybe when its a little warmer! Come enter my giveaway to win a scarf, flower pin, and necklace! Those shoes are making me extremely happy! May I come shop your closet? I am loving this "shopping" your closet and I am wondering if I can come shop it to! :) So I have a random question about the bowtied beauty boots ... I am dying over them and found a pair but I am wondering how then run .... I have read reviews and heard they can run 1/2 size big, do you think that is true? Thanks for your help! Jess- I actually thought they ran TTS I am almost universally a size 7 and sometimes when things run small a 7 1/2 I have a size 7 in the boots and they fit and are VERY comfortable! I hope that helps! I also know my sister wears and 8 which is her normal size as well! This made me laugh - my boys are home for a snow day today, and I'll bet the neighbors can hear me keeping them in line, even with the windows closed! You look totally adorable, I love you in that burgundy color and your green shoes are so happy and cute! When I first saw that dress I ttally thought of you--it just looked like something you would love and look so cute in! =) Love the remixing today...you look great! Those shoes are adorable and are the perfect finishing touch...love the color! Have a great day! PS--Is your sister gonna come back to blogging?? I'm sure she's busy with her move...just wondering! I miss her posts! I absolutely think you are probably an incredible role model for parenting. We all have our moments (ie: NEED some moments)! LOVE this combo. You did a great job keeping casual and classy, with great color. LOVE the pop in your shoesies! Hahahaha, you're too funny!! 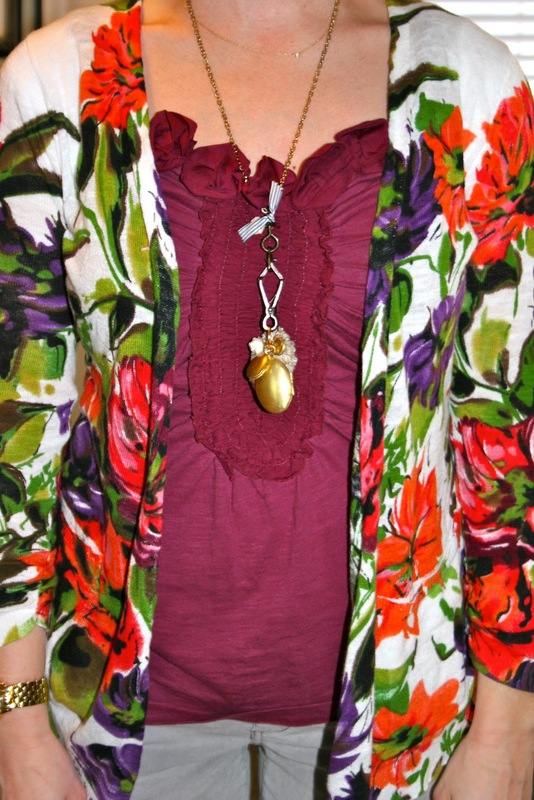 And I love how you're wearing bright florals in the winter time -- rock on, Tricia!! You make me laugh - I'm sure your daughter enjoys having her Mom help at her school and particpate in activities with her!! Love the bright colors in your cardi & shoes!! Oh - I forgot to say that I LOVE your shoes with that sweater... .CUTENESS! I have no words for the green ballet flats!